Equal parts nature guide, adventure story, and coffee table book! People are captivated by wild animals—by their strength and their size and by the things they do to stay alive. 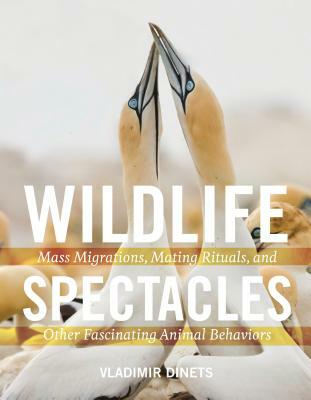 In Wildlife Spectacles zoologist Vladimir Dinets dives deep into this wonder, allowing curious readers to discover just how spectacular wild animals can be. In the rich, fully illustrated pages you’ll discover the migration of gray whales along the Pacific coast, the dancing alligators of the Everglades, the synchronized blinking of fireflies near Tennessee, the swarms of feeding bats over the Mississippi River, the blue-glowing scorpions of the Southwest desert, hundreds of wintering tundra swans in New Jersey, and much more. Vladimir Dinets was born in Russia and immigrated to the United States as a young man. He obtained his PhD in zoology from the University of Miami in 2011, with a focus on animal behavior. He has traveled and photographed extensively all over North America for 17 years. He is the author of Dragon Songs and the Peterson Guide to Finding Mammals in North America.